October gets a lot of attention as a month dedicated to raising awareness of breast cancer, but in September many organizations recognize childhood cancer. 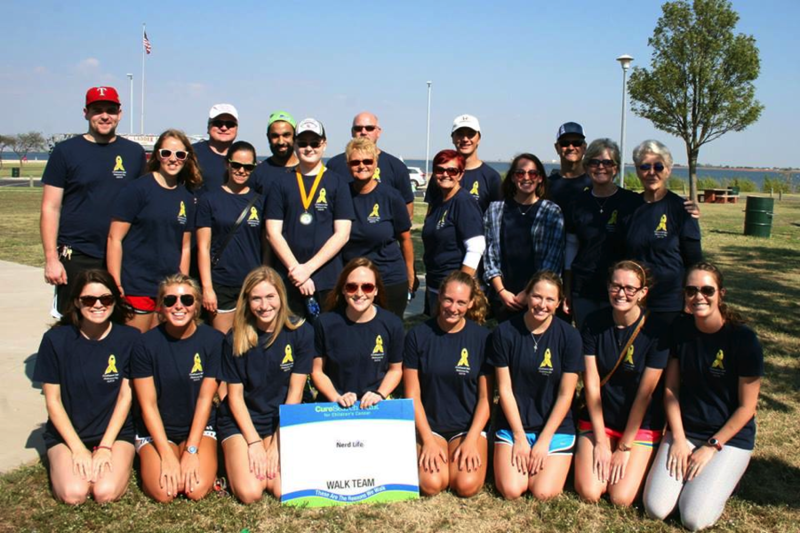 Last month the group CureSearch sponsored a walk to help raise research funds. The announcer walks to the stage and says, "Now we would like to ask all the survivors to come to the stage, this includes all of those who are currently in treatment and those who have survived, we’re going to have you say you name and accept a metal for being our superhero’s and todays CureSearch walk champions." Four-foot nine redhead, wide eyed and freckled Jeremy Smith heads over to the stage. At 14 years old you don’t know what to expect at an event like this but all you can do is hold your head high and say your name. Applause comes from his father, sister, friends and the hundreds of supporters gathered at the CureSearch walk to support childhood cancer. His sister Bekah recalls the day Jeremy was diagnosed. "It was day two of sorority recruitment when I got the text from my father; he actually just said Jeremy was just going to the hospital, until I got the text that said they think its Leukemia and so I left and went strait to the hospital, it was scary it was out of the blue, we had no clue what was happening." While Bekah drove to the hospital their father Donald sat among the chaos with Jeremy. "While we’re in the emergency room, we’re segregated from everyone else probably the hardest thing is he looks at me and says Dad I don’t want to die, that’s pretty rough." Stories like this aren’t uncommon in this crowd, but seeing 2 year olds in Batman suits and groups of little girls in bright pink t-shirts and bows shows this day is about celebrating life. "These kids are tougher than you can even imagine and its just sickening to think that a lot of the funding, there’s a lot that’s not dedicated to childhood cancer and that’s where we’re trying to raise the awareness." That’s Eric Robinson, community development manager for CureSearch. He told me that in the United States 42 children are diagnosed with childhood cancer every day but less than 2 percent of government funding goes to childhood cancer, leaving new drugs hard to find, and experimental drugs hard to fund. The mile long walk finally begins; Jeremy and his family walk in the middle of a line with hundreds of people directly or indirectly affected by childhood cancer. They are all wearing the same navy blue t-shirt with the team name: “Nerd life.” Jeremy’s sister Bekah said this is exactly what they needed. "We’re all fighting the same thing, we’re all just going for the cure, its just one big support system and all of the support is amazing and I am so thankful for that." Bekah and her family have much more to be thankful for. "When I was diagnosed I was definitely scared, you don’t really hear the stories of kids getting better, really the only stories you here are the kids that are lost through it. So I assumed it was a rare thing to get through but now that I know its 80 percent chance to actually survive through it and 90 percent now that I’m in remission." Even though Jeremy is in remission his father says he is on a 3-year chemo treatment plan to keep him healthy and Bekah says this walk is in hopes of preventing suffering of future childhood cancer victims. "It means a lot for us, we’re 100 percent trying to raise funds for childhood cancer because maybe it’s not going to be him that get cure automatically but if we can get the next kid cured on the spot that’s what we want." The money raised goes towards multiple organizations that help speed up the research process for new treatments for Childhood Cancer. Donate online or get involved in another cancer walk, go to the KGOU events page.